I have found that the key with kids is to keep them busy. The more activities they are involved in, the less likely they are to either demand screen time or destroy their playroom. I still haven't had a chance to get my German driver's license (not to mention Alex's car was in the shop for an oil change) so during the week when Alex is at work, the kids and I are stuck at home. If that wasn't hard enough, the weather has been abysmal, preventing us from being able to do a lot of outside play. We'd take the dog on walks a few times a day, but by the time we made it back to our porch, we'd all be wet and cold. Certainly not ideal weather for chalk drawing or soccer playing. All this meant that while Alex was off work, we needed to utilize our time wisely. The forecast called for rain by midday on Sunday, but since the kids woke Alex and myself up at 7am, we had plenty of time to go out in the morning. Since we'd only gotten a brief glimpse of Eifel Park the previous weekend, we decided to return to the park and explore more of the kid areas. We arrived right around 10:30am, half an hour after the place opened, and it was a ghost town. The threat of bad weather plus the chilly temperatures scared a lot of families away, I think. When you first enter Eifel Park, you walk along this quarter mile path with various woodland animals on your left, then you get dumped by some animatronic bears and food kiosks. Straight ahead is a toddler area with a small playground, a mini train ride, a balloon ride (kind of like a ripoff Dumbo) and a ball pit. That was as far as we made it that first trip, because Landon saw those attractions and was immediately distracted. There's a short walkway that leads away from the baby section and into another small part of the park that contains more food stations, a water ride, and the entrance to what's called the Eifel Coaster. Alex rode it and described it as a big slide on wheels. Whatever it is, it's a very popular attraction. I always see a line formed for it. Right past those items is a fork in the pathway. To the left is the path that leads to a 2k hike through the woods where the animals are housed. There's a falconry habitat with a stage for a show, a bear enclosure, a look out for a wolf habitat, and many other animals. The road of on that path is wide and the company runs a tram that will take guests up to the top of the park if they don't want to hike up. Alex and I took it the first time we visited, and it was a nice and relaxing way to see some of the inhabitants without having to worry about the kids running off. This time around, though, we chose to go to the right side of the path, which was a paved path winding up to the top. It was a steep climb and took a good twelve minutes to complete. My fitbit claimed it was the equivalent of one mile and 15 flights of stairs. Alex and I both appreciated the mini workout we were able to get in. I made the comment that the monorail ramp in Epcot's got nothing on Germany parks. Bring it on, Disney! I'll be a pro incline walker by the time I return. Backtracking to the top of the hill, the left side held construction toys for the kids complete with mock equipment. There was also one of those swinging rides where you're swung around in the air. The area dead ended with four amazing playground areas, more trampolines, self motored chair lifts, and a hedge maze. It's truly a young kid's dream play place. There's animals, water, slides, anything and everything a kid could want. Alex and I didn't regret buying a season pass at all. Unfortunately for us, we knew it was going to rain before too long, and we hadn't brought any food along, so on that day we stayed for about an hour and a half. Just enough time to see everything and get our bearings for the future. Turns out, one of Alex's friends from his last base got out of the military and is living here in Germany. A few villages over, in fact. They'd been trying to find a good time to meet up, and earlier in the week I had two different people on my Disney boards suggest I try a popular German food, called doner kebaps. The dish is actually Turkish, but they are very popular in Germany. It's sort of like the Chipotle of Germany. Doners consist of lamb or chicken (in this case chicken) that's cooked on a vertical spit and the meat is shaved off when needed. With a typical kebap, the cook will take a piece of flatbread, stuff it with cheese, then toast it. Once warm, they'll add sauce, stuff it with meat, then garnish it with cabbage, onions, tomatoes, lettuce, etc and then add another dolep of sauce. Anyways, I had heard of a popular doner place in the same village as Alex's friend, so we decided that afternoon to meet up for dinner. It was my brood, plus N. (Alex's friend) and his girlfriend, C. who happened to be German. Alex and N. seemed to enjoy catching up with each other, and I appreciated having someone help me pick the right dish to order. I wouldn't have known where to start, otherwise. Alex was wary of trying the doner, but N. talked him into it, and it was a good thing he did. Because both him and I fell in love with the dish. The sauce, whatever it was, was outstanding. It was like a mayonnaise, sour cream, yogurt-like concotion, and it paired perfectly with the flavor of the chicken. At times, it reminded me a little of a Philly Cheesesteak, but only in the texture of the meat. People have compared it to gyros, but since I've never had one of those before I cannot confirm that. Regardless, it was absolutely delicious, and combined with good company it made for a very pleasant evening in the middle of the week. Plus, you can't put a price on having someone who's familiar with your old home and already knows you when you're in a new town. To be able to say we had a house in _____ and them understand what that meant as far as drive time to proximity to places was a breath of fresh air. Alex had a 3 day weekend and never one to stay at home, he was itching to get out and do some exploring. The weather was forecasted for rain in the afternoon (no surprise there) but both of us NEEDED to get to a big city. These small farmlands are quaint and enjoyable for the day to day life, but we were desperately missing the hustle and bustle of a bigger population. So, we decided to check out the closest historical city to where we lived and then make our way over to an indoor playground for Landon once the rain arrived. The oldest city in Germany, it dates back to the 1st Century B.C. when the Romans conquered it and took over. A lot of the Roman structures are still standing and are available to tour, but Alex and I didn't want to touch too much into them on that day since we didn't have an entire day to devote to the city. 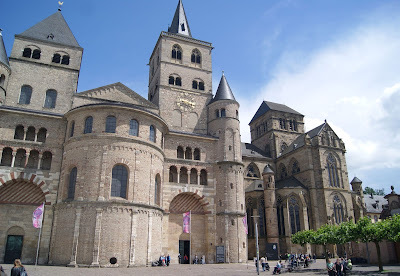 I am sure later on, I'll visit all the sights listed and write about my experience with them, but for now I'll just touch on the one place my family did get to see during our quick walk through of Trier. I had downloaded a parking app for Trier earlier in the day that kept an updated count of how many free parking spots there were in each garage located in the city. That made finding where to park a breeze once we arrived. (We left our house at 1:47pm and got to the Basilika parking structure at 2:20pm.) The garage dumped us right next to a cute little park, which was perfect for Landon. On the UNESCO World Heritage list, the High Cathedral of Saint Peter in Trier is the oldest cathedral in Germany and the site we were fortunate enough to see this past weekend. Down the street and around a corner from the park, we came upon the Cathedral square and the church itself. This was my first experience with any of Europe's old buildings, and I was just taken aback by how impressive it was. Right away I wished my recall of Humanities 101 was better. There was so much detail! The cathedral itself is broken into two parts. 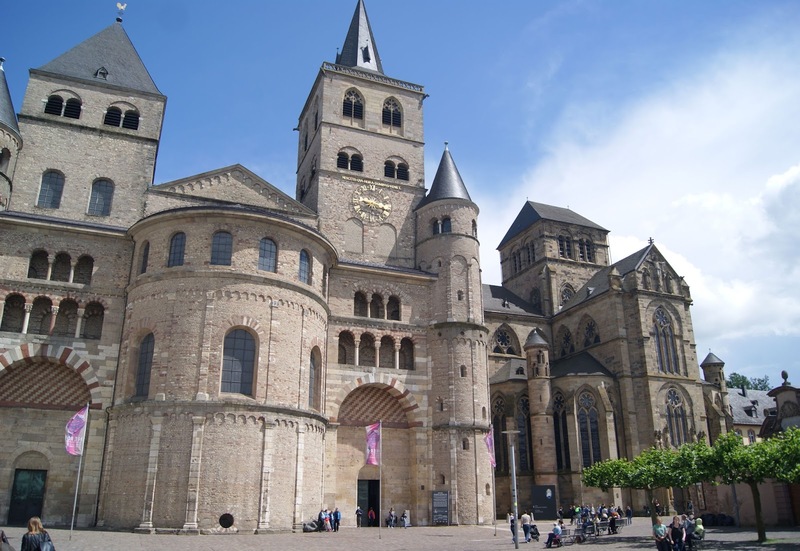 The West side (formerly a larger Roman church that was destroyed) was rebuilt and completed in 1035, and the East side was added later in the 1200s making it the first Gothic style church in Germany. You can clearly see the two different styles from the outside, but they blend together nicely. The biggest feature of this cathedral (besides its age) is the fact that in 1512, it was discovered that the Holy Robe of Christ and one of the Holy Nails was housed in the church. Meaning, the garment that Christ wore at his crucifixion and one of the nails from the cross are kept there. I did not know about this fact until after I returned home and did some research, but even if I had they are not visible to the public except every 20 or so years. But, still, to be that close to history is pretty incredible. Hundreds of thousands people make pilgrimages to see that very sight, and there I was just a short car ride away. Regardless of whether or not you're a believer, I'm sure you can appreciate the importance of that for those who do believe. The Cathedral was open to the public when we were there, and amazingly enough Landon remained quiet long enough for Alex and I to go inside and explore for a few minutes. The artwork was spectacular, and the minute I stepped foot inside, I understood why it wasn't hard for people to have strong faiths back in that time. You felt humbled by the grandeur of the stained glass windows and the sculptures and the 86ft high ceilings. Out of pure luck, Alex spotted a sign on display and we discovered a really cool treat occurring, called the Holy Door. It reads: "On December 8, 2015, Pope Francis opened a "Holy Year of Mercy" extending to the end of 2016. 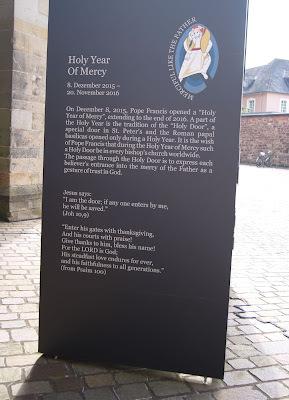 A part of the Holy Year is the tradition of the 'Holy Door," a special door in St. Peter's and the Roman papal basilicas opened only during a Holy Year. It is the wish of Pope Francis that during the Holy Year of Mercy such a Holy Door be in every bishop's church worldwide. The passage through the Holy Door is to express each believer's entrance into the mercy of the Father as a gesture of trust in God." 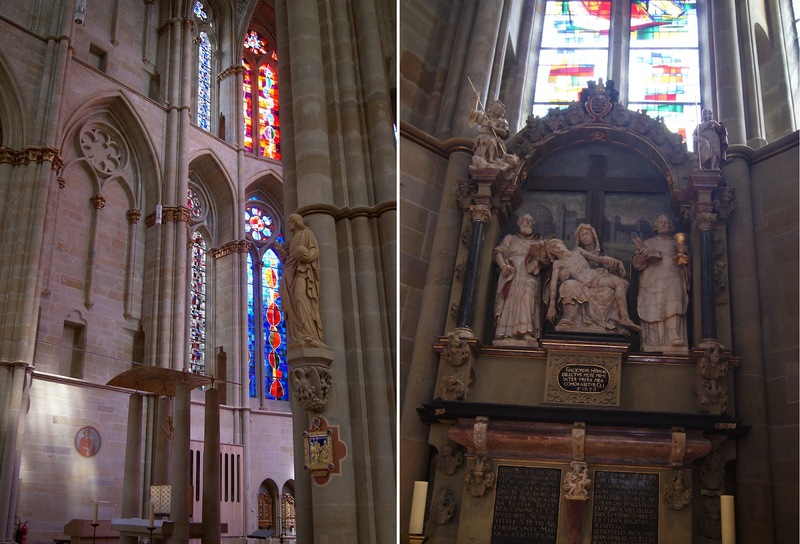 I felt extremely fortunate to be able to have experienced the Trier Cathedral, and I actually can't wait to return and examine the interior some more. I didn't even get to see the Altar on the Roman side of the church nor the popular organ housed there. Because Landon did so well during our tour, Alex and I let him walk along the market street afterwards, where we bought him the most delicious Italian ice we've found. For 1 Euro we got him a scoop that was completely worth it. And because my weakness is truffles, I had to stop on the way back to our car and buy a Dark Chocolate truffle from a Berlin factory. Europeans have some of the best food on Earth. In total, we were in the heart of Trier for 1hr 23 minutes. It cost us 2,20 Euro in parking, and it was worth every cent. I'm already excited to return and explore some of the Roman monuments such as the Porta Nigra and the Imperial Baths. 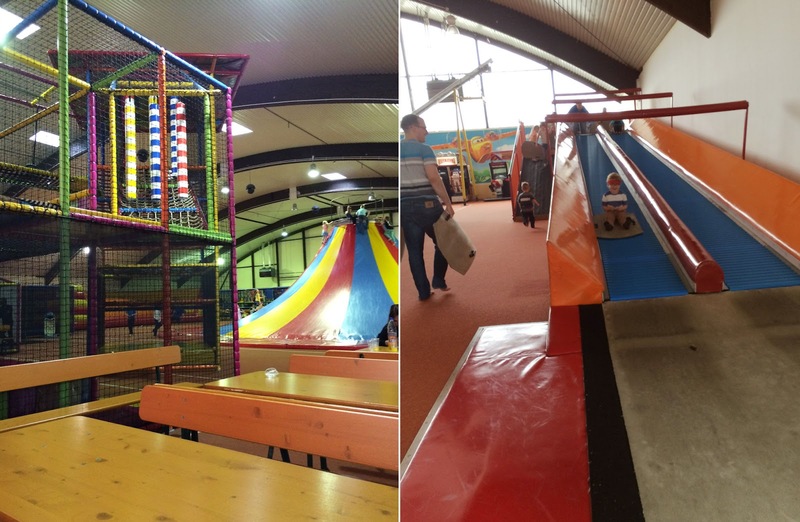 But for the rest of the afternoon, it was on to Trampoline Trier, and indoor play place for Landon (and adults). It cost us about 18 Euro to get in, and they had everything imaginable. 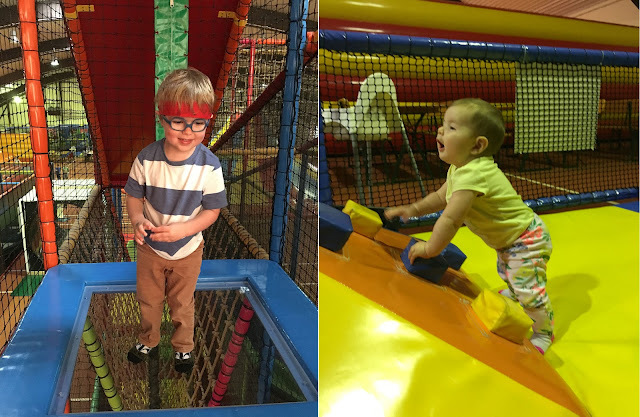 Bounce castles, climbing structures, slides, trampolines, little rides, and lots of space to run around. Landon, Alex, and I had quite a bit of fun trying out all the features. One of Alex's coworkers held a barbecue at their house. There were some other kids around Landon's age at the get together, and he appreciated the chance to run around and play with some other kid's toys. The only downside to the evening was that it was raining yet nobody blinked an eye at standing out in the wet. Apparently, that's normal here, and I just have to adapt and accept that I'm going to get wet a lot. People told me to embrace it and not let it stop me from experiencing Germany's offerings. For Father's Day, Alex wanted to go to Eifel Park to get a good walk in, so after a breakfast of French Toast and bacon (a RARE treat in this house) we packed a lunch and spent the afternoon watching Landon burn off his toddler energy. Then, for dinner, we had doners again. Yeah, they were that tasty. All in all, it was a great week, and I felt like we were starting to really dip our toes in the German waters. We should be getting our furniture later in the week, and the weather is supposed to be warm and sunny, so I'm positive that this coming week will hold just as much fun and entertainment as the last one.